Less than six months after General Mills sold Green Giant vegetables to B&G Foods for $765 million, the brand with the legendary green mascot has found itself a new agency, Deutsch NY. B&G, which is known for resurrecting dormant brands, has tasked its new agency with "reinventing" Green Giant and its 91-year-old mascot, according to sources at the agency. CEO Bob Cantwell recently said he plans to double what GM was spending to market the brand, from $16 million annually to about $32 million. "Green Giant deserves its rightful share," Cantwell told Fortune in September. B&G did not immediately return calls, and Deutsch declined to comment. The Interpublic Group agency nabbed the new business following a competitive pitch. Droga5 was among the agencies talking to the client, but never offered a formal pitch, according to sources familiar with the process. The most recent agency for the brand was longtime General Mills shop Saatchi & Saatchi, though that relationship ended when the brand was sold, and the shop did not participate in the recent pitch. The win represents a comeback for Deutsch NY, which has had only two significant business wins in recent memory: Samsung’s B-to-B advertising in July 2015 (about $25 million in annual media spending) and Sherwin Williams in November 2014 (about $14 million). Perhaps most impressive, Deutsch NY won Green Giant without a chief creative officer; Kerry Keenan parted ways with the company in August, and no replacement has yet been named. B&G, which also owns Mrs. Dash, Emeril’s and Pirate’s Booty, purchased Green Giant at a time when sales of frozen vegetables were on the decline. Though Green Giant remained number two in the category behind Birds Eye (AOR: BBDO), sales dropped 11% in 2014, which helped prompt General Mills to unload it. Based in Parsippany N.J., B&G has a track record of turning around castoff brands from General Mills and Kraft, including Cream of Wheat, Ortega Taco Shells and B&M Baked Beans. At the time the acquisition was announced, Cantwell said in a statement that the company planned to offer "new and innovative products that will respond to the needs of today's health-conscious consumer." In addition to peas, Green Giant produces corn, broccoli and other frozen vegetables. First appearing in 1925 as a mascot for the Minnesota Valley Company, the Jolly Green Giant was originally a diminutive yellow creature dwarfed by a giant peapod. In 1936, Leo Burnett turned him green and added the "jolly" to his name. Over the decades, the giant became taller (and better looking). The familiar towering colossus with the leafy green toga, red scarf and familiar catchphrase, "Ho Ho Ho," emerged in the 1960s. In the 1970s, his scarf was discarded. The Minnesota Valley Company changed its name to the Green Giant Company, and then merged with the Pillsbury Company in 1979. 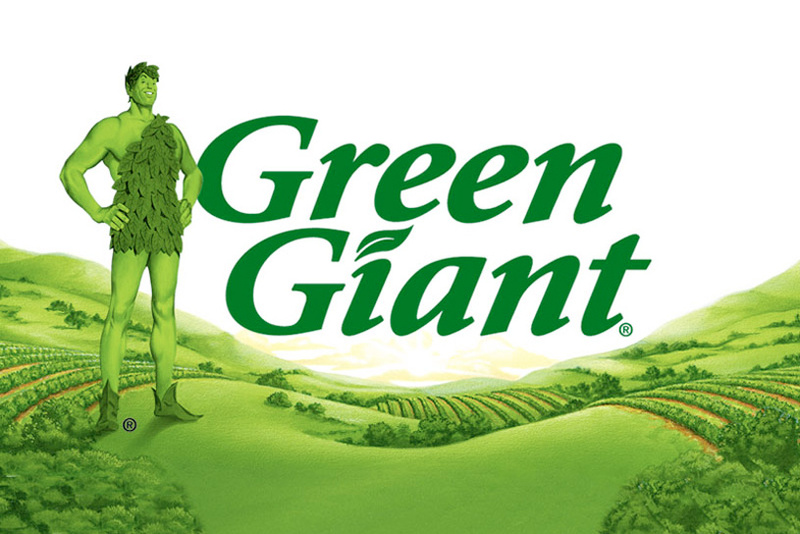 General Mills bought Green Giant in 2001. The Jolly Green Giant had made occasional appearances in the brand’s advertising during the last decade, but has lately been mostly absent from the airwaves. The brand itself hasn’t gone completely into hibernation in recent years. It has 4,500 followers on Pinterest, and more than 30,000 followers on Twitter. Both feeds primarily post recipes, though both have gone silent since October. In 1999, Advertising Age named the Jolly Green Giant the #3 most iconic advertising icon of the Twentieth Century, behind Ronald McDonald and the Marlboro Man. General Mills continues to operate the Green Giant brand in Europe.